John David, Head of Horticultural Taxonomy RHS Garden, Wisley. John is currently leading on developing the RHS’s horticultural taxonomic research, particularly in the use of molecular techniques for more objective characterisation of horticultural plants. This work has been focused on invasive plants of horticultural origin. 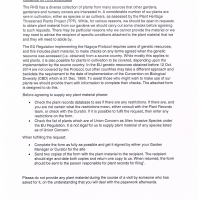 John is responsible for the RHS herbarium and the Society’s international cultivar registers. He has been actively involved with policy questions to do with invasive plants, the EU Plant Reproductive Materials legislation and, more recently, the Nagoya Protocol, representing the RHS on various stakeholder bodies. In addition to his RHS role, John is Collections Secretary of the Linnean Society and member of the Chelsea Physic Garden Advisory Committee, as well as being a member of the Editorial Committee for the International Code of Nomenclature for Cultivated Plants.